Oman’s premier luxury and lifestyle brands sign 12-month partnership agreement to elevate the country’s golfing offering. 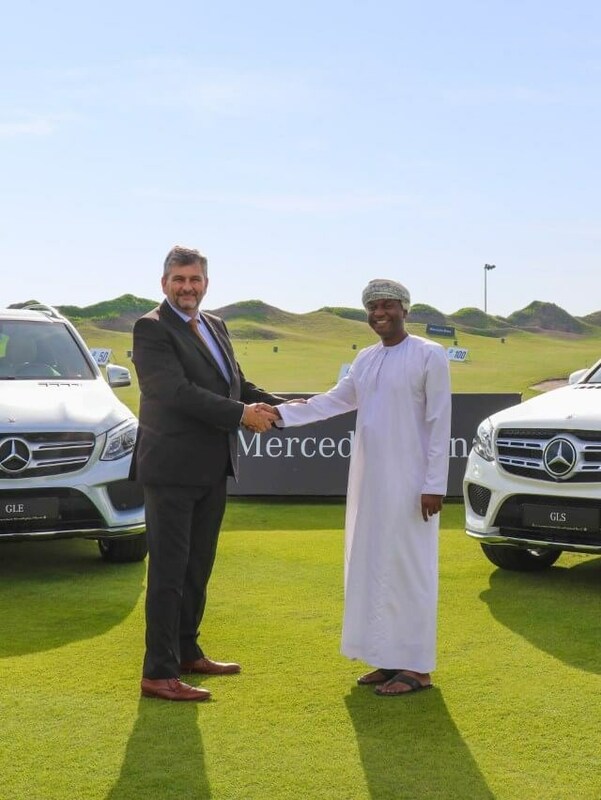 Muscat, Oman – 18 February 2018: Al Mouj Golf, the award-winning signature course at Al Mouj Muscat, has signed a partnership agreement with Mercedes–Benz Oman for 2018 bringing together two of the Sultanate’s leading luxury and lifestyle icons. In its sixth year, this renewed partnership will drive new experiences for golfers and Mercedes-Benz enthusiasts alike, as they enjoy the outstanding leisure and sporting amenities of Al Mouj Golf. Over the next 12 months, guests and club members will be able to enjoy the Mercedes-Benz Member Guest event as well as the popular ‘She’s Mercedes’ ladies coffee mornings. The latest models of the Mercedes-Benz cars will also be on show at the club for guests and members to admire. Voted Best Golf Course of the Year at the 2016 Middle East Golf Awards, and Ranked No.2 in the Middle East by Golf Digest, Al Mouj Golf is an 18 hole Par 72 links style course running alongside a 2-kilometre stretch of Muscat’s pristine coastline. The 7,342-yard course of lush green grass is peppered with bunkers, water hazards and natural dunes. Al Mouj Golf is also home to the Academy, Muscat’s first golf academy offering unrivalled levels of world-class golf tuition for all ages and backgrounds. Timings: Start 9:00 am - registration from 8:30 am. Timings: Start 8:30 am - registration from 8:00 am. Spread along a stunning 6 km stretch of Muscat’s coastline, this world-class Integrated Tourism Complex comprises a group of luxury residential properties including Villas, Townhouses and Apartments, commercial units, retail and dining facilities and Oman’s only signature designed PGA Standard 18-hole links golf course, designed by Greg Norman. Al Mouj Muscat is also home to the 400 berth Al Mouj Marina, Oman’s largest private yachting hub and most recently The Walk, a 70-unit retail area which forms the commercial and leisure hub of the community. The next phase of development will see luxury hotels, new residential leisure and hospitality offerings. Al Mouj Muscat is a phased development which provides a world-class lifestyle destination. Established in 2008, Oman Sail is a national initiative that uses the power of sport to contribute to the development of the Omani people. The equal opportunity project runs sailing programmes for thousands of young Omani men and women, inspiring a new generation to discover sailing. It encompasses a national sailing squad and high achieving inshore and offshore racing teams, all of which benefit from world-class coaching and whose ultimate objective is to win an Olympic medal for Oman. The goal is to rekindle Oman’s maritime heritage while raising the country’s regional and international profile as a high-end tourist and foreign investment destination, through competitive sailing at home and abroad. Oman Sail seeks to instil confidence and to teach valuable, transferable life skills to a generation of Omanis.